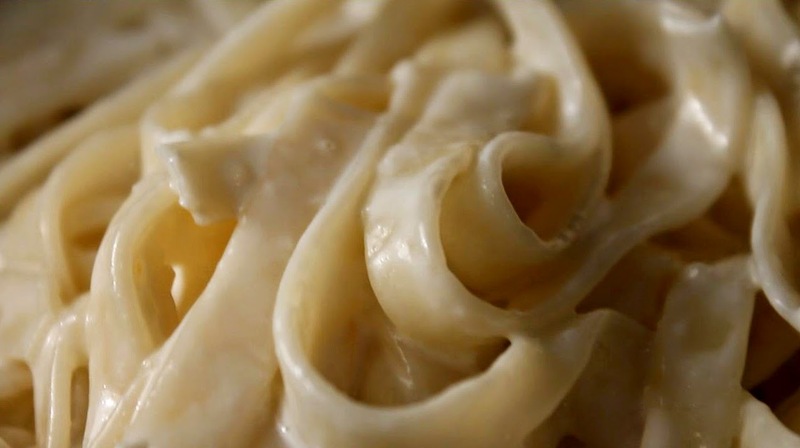 Crazy creamy and too rich for words, this chef has a new favorite pasta dish, and it's Fettuccine Alfredo. So easy and quick to make, this is instant gratification. 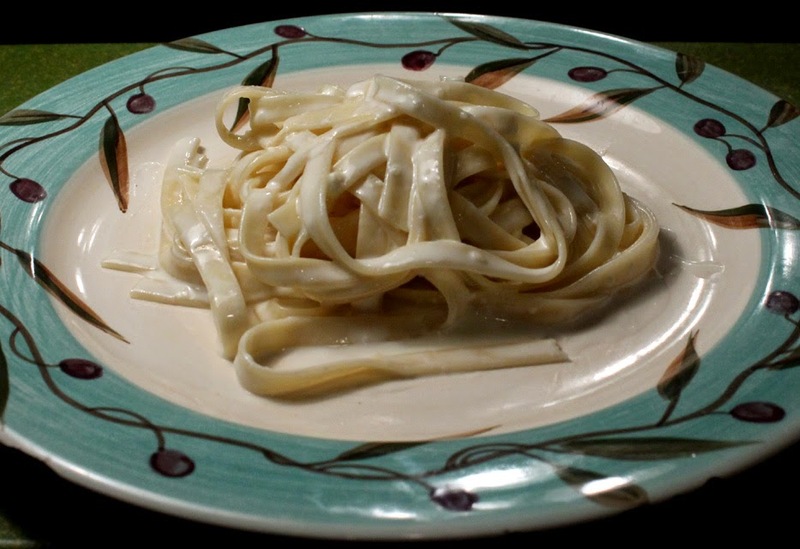 Fettuccini Alfredo is from a Rome, Italy restaurant called Alfredo in 1914, and the ingredients originally were just a lot of melted butter and cooked fettuccini. That recipe has be Americanized with the addition of cream, but less butter. I can see why flat noodle fettucine is used - more surface for the thick savory sauce to cling to. I used to cook Spaghetti alla Carbonara, made with eggs yokes mixed into crispy bacon, the most (for my video recipe, click here); but it's time to set it aside -- a new luscious pasta entree has taken it's place. I've had this recipe compared to Olive Garden's Fettuccine Alfredo. Well, you'll have to make it and let me know if it passes muster. And boy is it cheap, just the way this Chintzy Chef likes it. 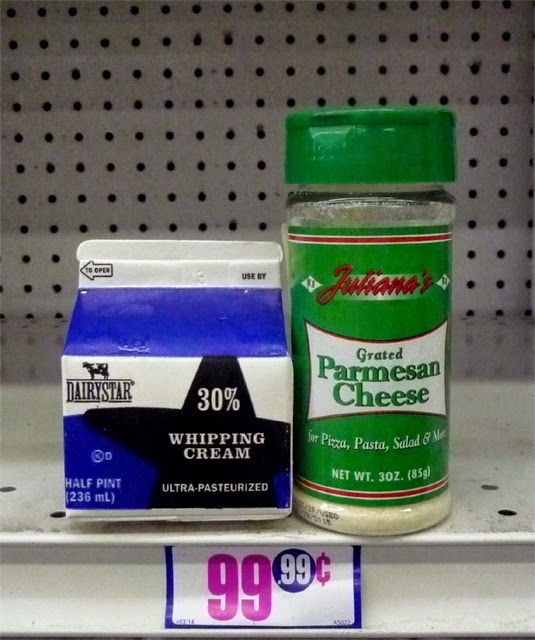 A package of fettuccine, a small pint carton of half and half or cream, a pat of butter, and half a plastic shaker container of grated parmesan, can all be had for around a buck each, and you'll get several servings, too. This is a dish best made with whole milk, half and half, or cream. You can go easy on the butter with all this high fat content floating around, but do use a little, the flavor is worth the calorie count. Now, I use dried grated parmesan cheese that has probably been on the grocery shelf since the last century, not the best I know, but I look at it as "extra" dry aged! It has a grainy texture when used to sprinkle over pasta, but it actually breaks down and melts into the heating cream to thicken and flavor the sauce. Of course, if this is a special meal for date night then go all out and use fresh shaved Parmigiano-Reggiano cheese. So for a quick, cheap, indulgent, and scrumptious entree, try out The 99 Cent Chef's minimalist masterpiece, Fettuccine Alfredo -- go ahead you deserve it. Play it here, video runs 1 minutes, 53 seconds. 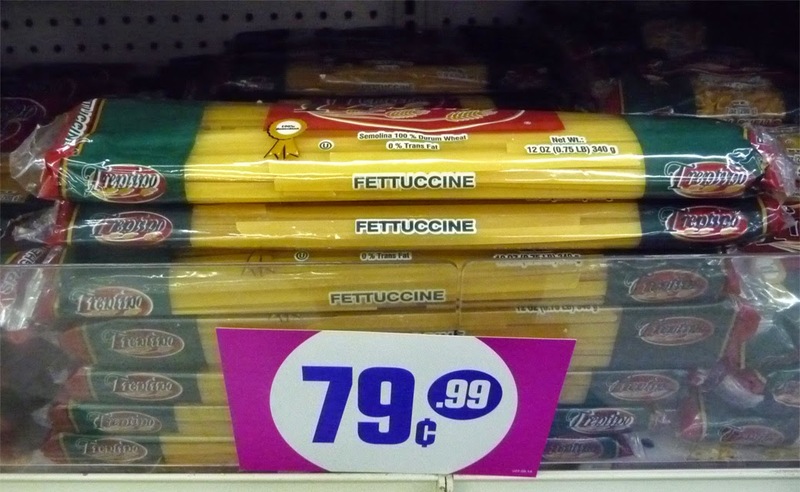 12 to 16 ounce package of fettuccini pasta - or, any pasta type is delish covered in Alfredo sauce! 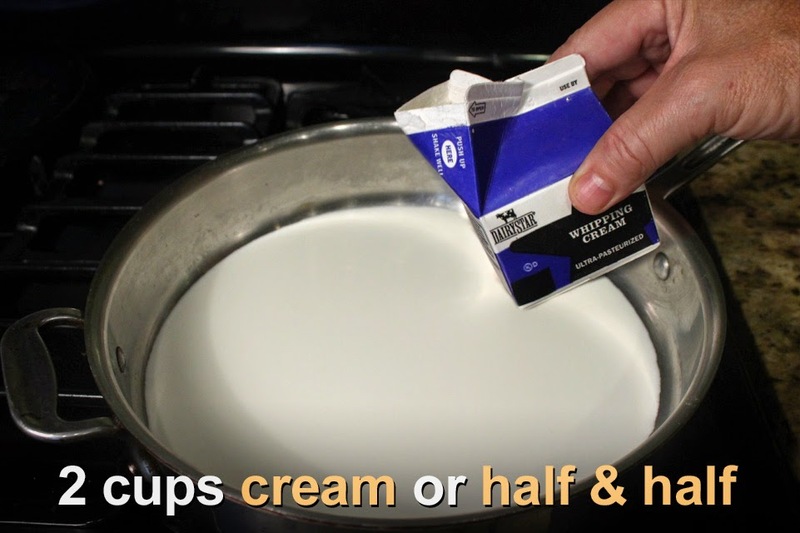 2 cups of half and half, or cream - if you must, it's okay to use regular or low fat milk. 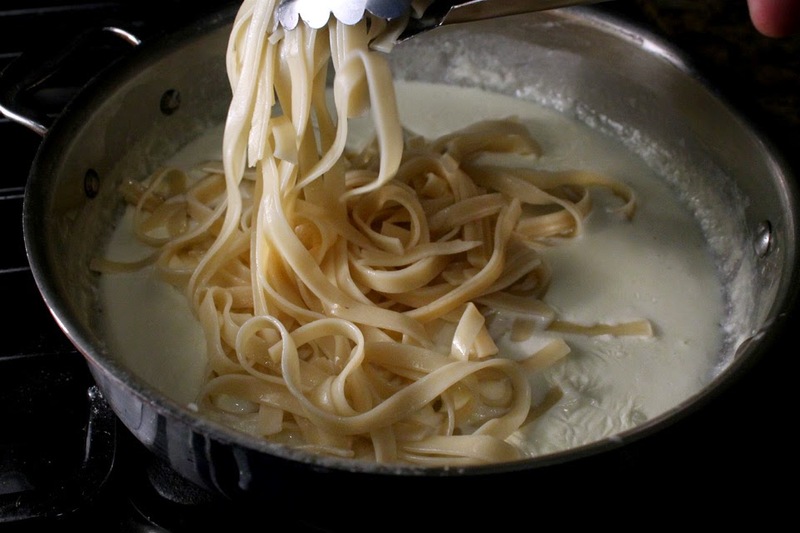 If you like a lot of Alfredo Sauce, it's okay to add more cream or milk. 1 pat of butter - make it a big slice! Okay to use your favorite butter substitute. 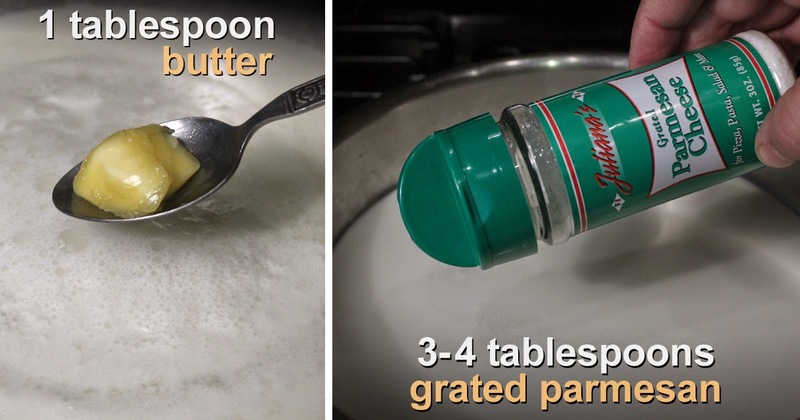 3-4 tablespoons of grated parmesan cheese - of course, you can use fresh grated. Go ahead and use as much as you want, too. Pepper to taste - optional. I don't add salt, as I find parmesan cheese is salty enough. Start cooking pasta according to package directions - I usually shave off a minute or two for al dente (taste for amount of chewiness). Best to get water boiling then add pasta. Carefully stir for the first minute to separate strands of fettuccini. I don't add salt to the water, as the parmesan cheese has plenty of salt for my taste. 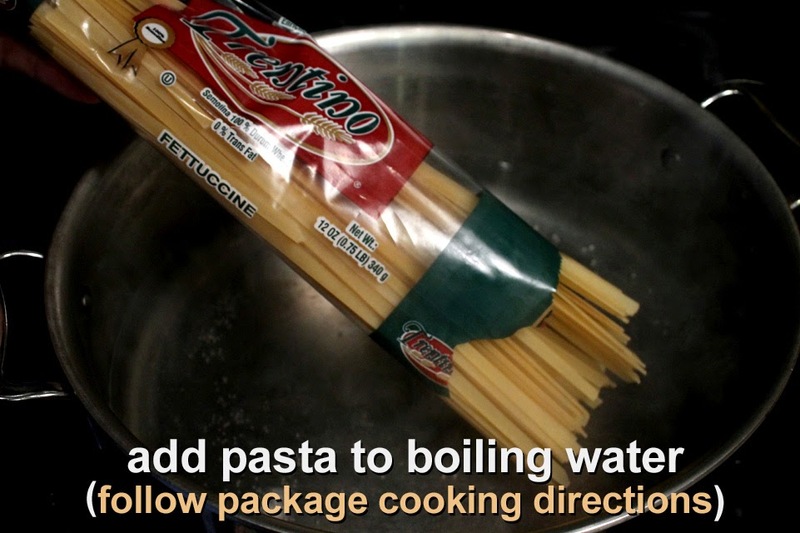 While pasta water heats up, in a large pan add milk or cream over a medium heat. 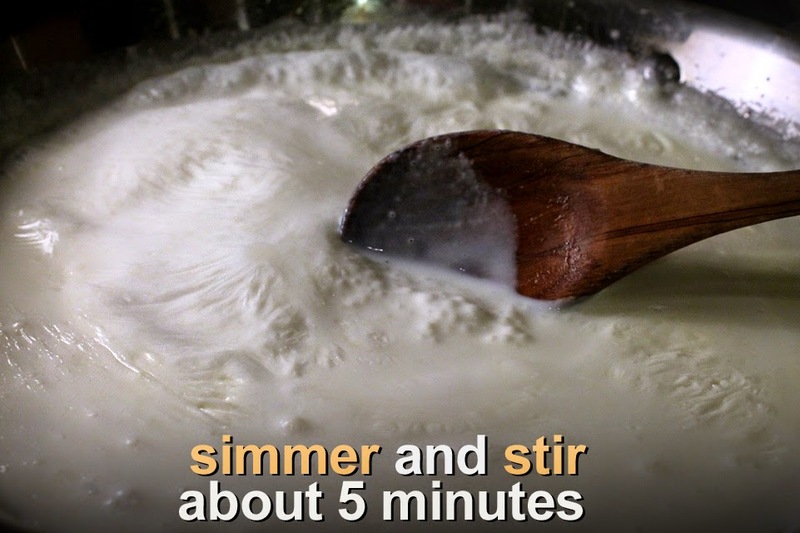 Bring cream to a low simmer. Finally add grated parmesan and butter. 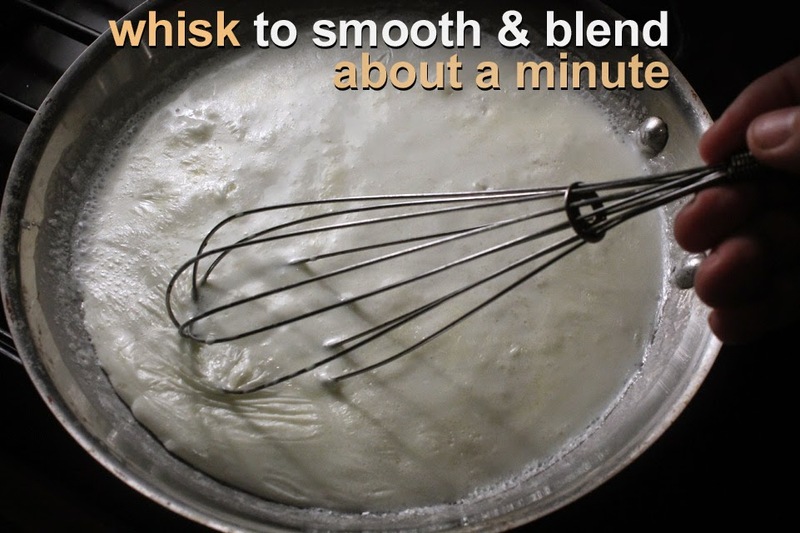 Use a large fork or whisk to smooth out the Alfredo Sauce. Low simmer for about 5 minutes. This will reduce and thicken the cream sauce (especially when the pasta is added.) You want to scrape along the edges of pan too, as the cream may stick to the pan and get a little gummy. The pasta should be ready about now (if it finishes early then cool to stop cooking and set aside.) Drain the pasta (I usually just lift it out of the boiling water,) mixing it into the heated Alfredo Sauce. Sprinkle with pepper if you like, and serve hot and immediately! 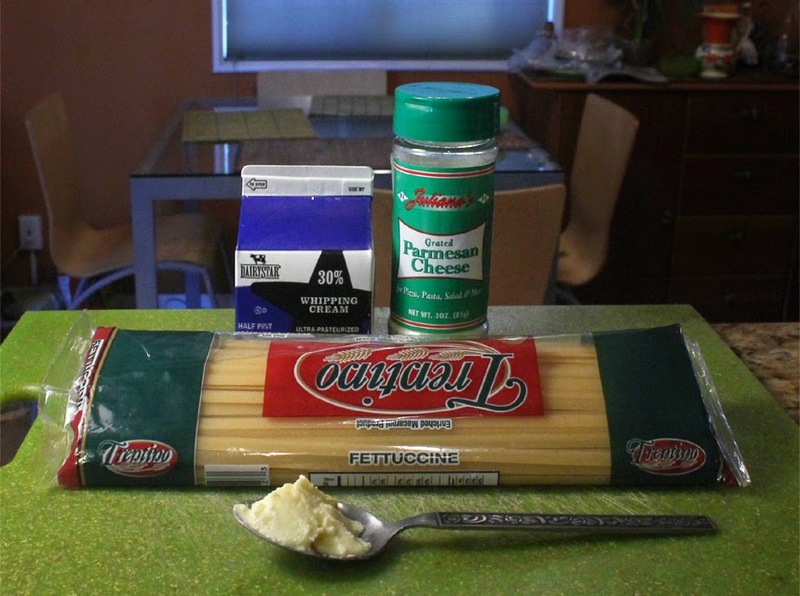 This recipe makes a lot of Fettuccini Alfredo, enough for 3-4 servings. Surprisingly it reheats the next day fine. The sauce thickens, but you can drizzle on a tablespoon of regular milk to bring it back, close to normal. For this recipe I normally use Half and Half, but in the video I used Whipping Cream - that's what I found on sale this time. You can increase the amount of cream or milk if you like a lot of Alfredo Sauce - same applies to parmesan cheese. Thanks for the quick easy recipe. I love fettuccine alfredo!